I just got tweeted some interesting news regarding our beloved star-signs! 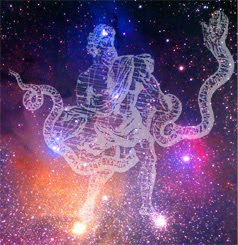 Meet "Ophiuchus", the 13th sign of the zodiac. Apparently already in use 3000 years ago with the babylonians, credited for having "invented" the zodiac, Ophiuchus, running approximately between 29 November and 17 December, got excluded arbitrarily when the babylonians decided to work with only 12 signs (and we thought that only Catholics would arbitrarily exclude parts of their religion to suit them better...). Now, 3000 years later, thanks to a shift in the Earth's axis, and according to Parke Kunkle, a board member of the Minnesota Planetarium Society, our old, familiar signs, have also shifted seats, creating room for a 13th guest. This is some more information on Ophiuchus. Go and check on this page if your sign has been affected, whether you believe in the Zodiac or not (I don't, but it's amusing...). I am still very much a Taurean, but, if Mr. Kunkle is to be believed, my son is actually not a Gemini, but a Taurean as well (version that I would actually prefer, as Gemini men are all über intelligent heartbreakers with the attention span of a fruit-fly... Allegedly...), and my husband is not a Piscean, but actually an Aquarian, which I can appreciate, since Pisceans are quite devoid of any aggression, but Aquarians can be cosmic rottweilers if they want to, and my dad is actually not a Taurean anymore, but an Aries, which suits him fine as he displays the "teak-head" stubbornness of this latter sign. If you happen to be so very lucky and be born between Nov 29th and Dec 17, then YOU are an Ophiuchus! Congratulations!! How do you feel? Not a catchy name, I admit, but at least you are original. Don't get put off by the strangeness of the name! Soon enough we will stop reacting to it like it's an infectious disease ( 'Hi, I'm Joe and I am an Ophiuchus... Am I still getting laid?' ). It remains to be seen where the sign characteristics of Ophiuchus are. Has anybody written them yet?